Jayne Cobb, also known as “The Hero of Canton,” is the wise-cracking, slightly off balance, mercenary for hire and sidekick to Captain Malcolm Reynolds - the proprietor of the Firefly class space vessel known as Serenity. ​Jayne’s style, much like his personality and behavior, is somewhat unpredictable. It is mostly business, being comprised of mainly military surplus but with some unique touches (like a special hat his mother lovingly made for him) sprinkled in for good measure. ​Where Can I get Some Boots Like That? ​Since we are already on the subject, Jayne's signature hat seems like a good starting point. This bright orange and gold knit hat was crafted for Jayne by his mother (Radiant Cobb). If you are the crafty type, there are knitting patterns so that you could make your own Jayne Cobb hat. ​I personally am not that creative so I would prefer to just purchase a high quality replica. The best one I’ve found so far is this replica on Amazon. ​Jayne’s Sun hat from the episode “Safe” is an often overlooked alternative when it comes to Jayne Cobb headgear options. It is functional as well as stylish and unique. This Columbia sun hat looks nearly identical to Jayne's. ​When it comes to Jayne Cobb’s jacket or Jayne Cobb’s coat, there really isn’t a great amount of style, but there is plenty of swagger. He really only wears two different jackets that I can think of off hand, and really only one of those is worn prominently. The first jacket Jayne is known for is his green military jacket. It's pretty basic with only a few noticeable features, such as the patch only on the left shoulder, and there are four stars sewn into each epaulette. ​If you’re in the market for a Jayne Cobb coat, here is a similar green military jacket I found on Amazon. ​The only other jacket I can recall him wearing would be his brown camo jacket. I’ve seen a lot of interest in some the forums as to if anyone has ever been able to track down a perfect match. Unfortunately to my knowledge nobody has, but I have included a link to another very similar camo jacket, the Dig camo rain jacket. ​If you are looking to do some Jayne Cobb Cosplay or possibly just want to pick up a piece of Jayne Cobb’s outfit for your own wardrobe, the right Jayne Cobb shirt is a simple and effective way to compliment the look you’re going for or complete that Jayne Cobb costume. ​Throughout the series and beyond, many different shirts were showcased by the hero of Canton. Some of the attire worn by Jayne Cobb is simple, professional and basically appropriate for a mercenary. Some is a bit more casual and carefree. ​Such as for example his famous “Fighting Elves 83” t-shirt, which you can find here on Amazon. 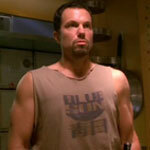 ​Who could forget the infamous “Blue Sun” shirt worn by Jayne when River slashes him because of the logo. ​I’ve been seeing this shirt more and more in recent years at conventions and it’s really no surprise. It’s a stylish shirt with an interesting design. Also if you are looking to pick up this classic Cobb tee, it is carried by Amazon. ​Finally, My personal favorite look for the J-man the khaki military tee. ​He really looks tough in his full military style garb in my personal opinion. This shirt is plain, simple and additionally it’s perfect as a costume piece because it’s versatile enough to be just an everyday wearing shirt as well. Here’s another Amazon link for a similar khaki military shirt: men's military t-shirt. Jayne Cobb is just a man, he puts his Jayne Cobb slacks on one leg at a time just like most people. When he does they are most certainly Earth-tone cargo pants. Because that is what he seems to prefer. Who could blame him really? There is so much available storage space in cargo pants I often wonder why I wear anything else. Not to mention Jayne’s pants go with just about everything. ​While compiling all of my research in preparation for putting this guide together, I was able to locate two different kinds of cargo pants that both match Jayne Cobb’s very closely. They are both available in a variety of colors to get your Jayne Cobb look just right. ​This pair of Match Men's cargo pants seem to match the baginess of Jayne's pants more accurately but they do have the extra pockets if you’re worried about making an exact match. ​This other pair of Match Men's pair looks to be a slightly slimmer fit but the pockets more closely resemble Jayne’s. Check them out if you’re feeling so inclined. Last but not least we come to Jayne Cobb’s boots. Jayne’s footwear, like much of the rest of his attire, is typical mercenary garb, being either black or brown or black with brown combat boots. These boots seem to be quite tricky to track down. ​I haven’t quite found a perfect match, but I did find these black GI Jungle combat boots that looks really similar to Jayne's. ​That nearly wraps up this style breakdown for Jayne Cobb as far as clothing is concerned. but there is still much more of Jayne Weapons and accessories to cover if you’re interested in completing an authentic Jayne Cobb outfit you will still need a few more things, but worry not fellow browncoats.